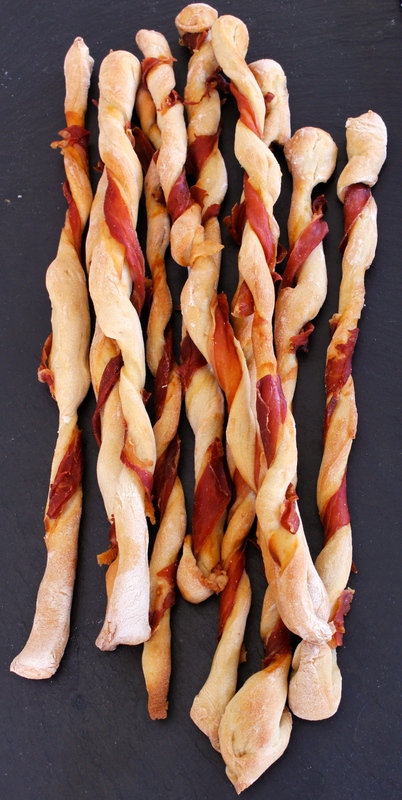 Parma ham breadsticks | dash.drizzle.dollop.devour. A long bank holiday weekend meant plenty of opportunity to get the oven on and do some baking. And what could a better start than warm, fresh breadsticks interlaced with salty shards of parma ham? These aren’t the dry, crunchy variety you can buy in the shops; they have a crisp exterior, but retain a tender crumb inside. The spirals of parma ham are alternately soft and melting then crisp and salty where they have been exposed to the heat of the oven. I can think of oodles of things to eat these with – maybe dunked into soup or a runny boiled egg, or maybe with a nice cold pre-dinner aperitif or perhaps as part of a tapas supper. Breadsticks are a non-scary way to get into bread making, since I don’t think you really need technical perfection for them to taste and look great. The only thing needed is a bit of pre-planning and patience, as the dough needs a good hour or so to rise, but once the dough is made it can be left to its own devices whilst you get on with other things. Weigh 250g strong white bread flour into a bowl, then add 5g salt on one side and 5g instant easy blend yeast on the other. Weigh 175g luke warm water and add 1 tbsp olive oil and stir into the dough. It will be very sticky, but don’t be scared and add extra flour, not just yet anyway. Tip the dough onto your work surface and begin kneading it – stretching the dough away from you and folding it back on itself. Slowly but surely, the stickiness should begin to dissipate and an elastic dough will form. This should take around 10 minutes. If it remains unworkably sticky after 5 minutes, add a little extra flour, but have faith at the start! Form the kneaded dough into a ball and place into a lightly oiled bowl, cover with cling film and leave somewhere warmish to rise for a good hour. It should double in size. Once it has risen, gently form it into a rectangle and cut into 12 strips. The length of your rectangle should be a little shorter than the length of your baking trays. Take a packet of 6-8 parma ham slices and cut into 1cm strips. For this recipe, I find the ready sliced ham from the supermarket easiest, since the slices are a bit more uniform and easy to cut up. Even so, you will likely find you have some straggly bits and pieces and your slices won’t be as long as the sticks. A little artistry is needed to coax the delicate slivers around the dough, twisting it all gently together as you go, to create the spiral form. You’ll probably find you need a couple of slivers of ham to go around the length of each breadstick. Tuck any stray ends of ham into the twists and folds of the dough to make them nice and neat. Don’t worry too much about making them perfect though- as the dough rises and expands it will disguise any messy bits. Place them on a lightly oiled baking tray or two, allowing a little room inbetween for them to expand. Leave to rest for another 30 minutes. Meanwhile preheat the oven to 200C and once they’ve rested, pop your breadsticks in to bake for 15-20minutes, keeping an eye on them. They are ready when golden brown all over. Shopping list: 250g strong white flour, 5g dried instant yeast, 1 pack parma ham slices about 6-8 slices, olive oil and salt.